It is interesting to note that this Book of Rules pre-dated the official opening of the 'Eastern Railway' by 2 years, and in so being gained the honour of being the first electrical means of controlling trains along single line sections in Western Australia. 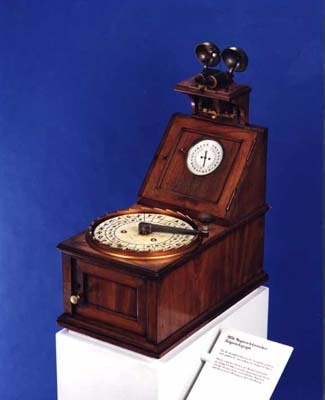 "...a convenient and trustworhy apparatus" that had been constructed for use on the Bavarian Telegraph Lines. They later found use on the railway lines of Russia and Europe, and of course Western Australia. The operator of the instrument was provided with a large handle above a notched circle, each notch represented by an alphabetic character. Inside the instrument, and worked by way of the handle, a coil of insulated wire was wound around a soft metal core, all of which rotated between the poles of a set of twelve permanent magnets. The rotating motion of the coil between the permanent magnets produced alternating positive and negative currents, which when transmitted down the telegraph line to the distant station, passed through the coils of an electro-magnet which caused the armature of the receiving instrument's smaller indicator dial to vibrate, which turned an escape wheel that drove the indicator dial pointer to rotate to the matching character of the sending instrument. Apart from the large handle, each instrument was provided with a Indicator Dial re-set facility in the form of an Ivory knob to the left of the Indicator Dial (and therefore out of view in the above photo) and a switch above the Indicator Dial that connected the line current to either the Indicator Dial or the Alarm (the two 'Call Bells' mounted at the top of the instrument). 351. For transmitting Signals from Station to Station the handle of the large dial should be turned from left to right at a speed of about 120 revolutions per minute, allowing the handles to fall into the notches of the of the metal ring at the letters to be communicated. The Station required must be called by stopping the handle for an instant at the letter representing the Station to be communicated with, and then continue the revolution to zero (marked * ). This is repeated three or four times, stopping at letter of your own Station, and then resting for a moment to give the Stations called an opportunity to reply. If the Signal in answer to the call be given while a Station is calling, the needles of the small dials throughout the line are thrown into a state of confusion, so care should be used in calling, and time given at intervals for the reply Signal. It is necessary to start the motion of the handle of the transmitter with a sudden jerk to insure the needle following from the zero point, and it should be dropped into the notches in a firm manner. The operator should allow his eye to travel to the letter required before moving the handle, he will then with greater certainty hit the notch in the metal rim. 352. When the instruments are at rest, the handle and needles should all point to the zero, or blank spaces on the dials. The little ivory knob at the side of the small dial, when pressed in, will stop the needle of the indicator at zero; when the handle of the large dial is turned round by this means the instruments can be corrected if thrown out of adjustment. 353. After each word has been telegraphed, the handle of the transmitting instrument is to be brought to the blank space, to give the receiving Station an opportunity to transmit the sign "understood" which is once around from zero to zero. If the word is not understood, the needle must be stopped at R, and then continued to zero - the sending Station then repeats the word. 354. At the end of a message the transmitter should turn the handle twice round, to signify that the message is completed. 355. If the sender wishes to transmit figures, &c., on the inner circle, he must give the letter N between two complete revolutions from zero; if he desires to return to letters, he must give the letter L between two revolutions from zero. F do. full stop . Q do. quotation " "
The two last-named letters are given before and after the word or words quoted in parenthesis. Pages 101 to 103, Rules and Regulations, 1879. Regulations for Single Line working by Telegraph System. NOTE: This page is under development - please check back later, however, if you have any additional information on this type of train working, it would be most welcome - please use this e-mail.